Top: Main street in Sainte-Marie-aux-Mines. Bottom, from left to right: Terra Mineralia quartz specimen; Moor bearing emeralds; the city of Dresden. • June 27: Arrive at hotel in Obernai, near Strasbourg, France. First dinner with the group. • June 28: Attend the wonderful Sainte-Marie-aux-Mines Mineral & Gem show: a guided tour with curator Eloïse Gaillou. Visit of the show special exhibit. This wulfenite from the Red Cloud Mine, Arizona was part of the special exhibit on "American Treasures" at the Sainte-Marie-aux-Mines show in 2013. Collection: Musée des Mines ParisTech (copyright: E. Gaillou). • June 29: Free morning at the show. Afternoon: visit the silver Tellure mine and museum near Sainte-Marie. 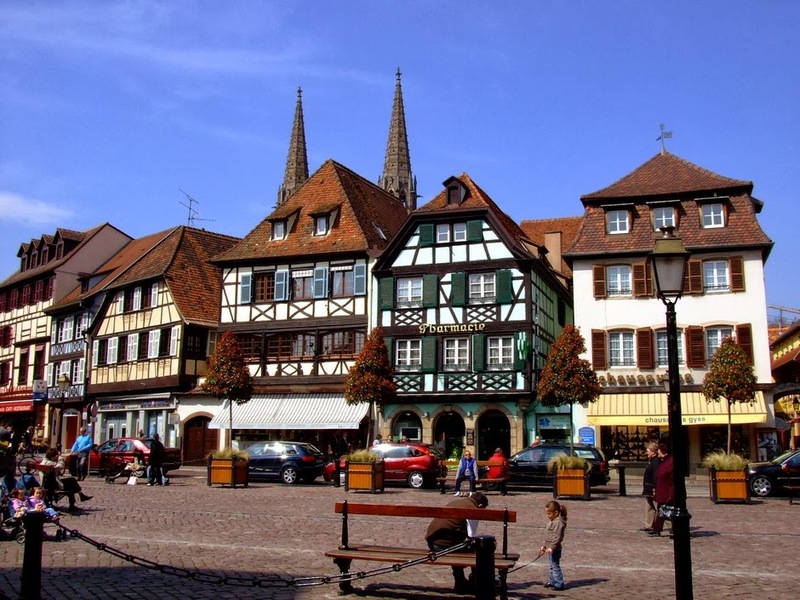 • June 30: Visit a mine in the Vosges Mountains. 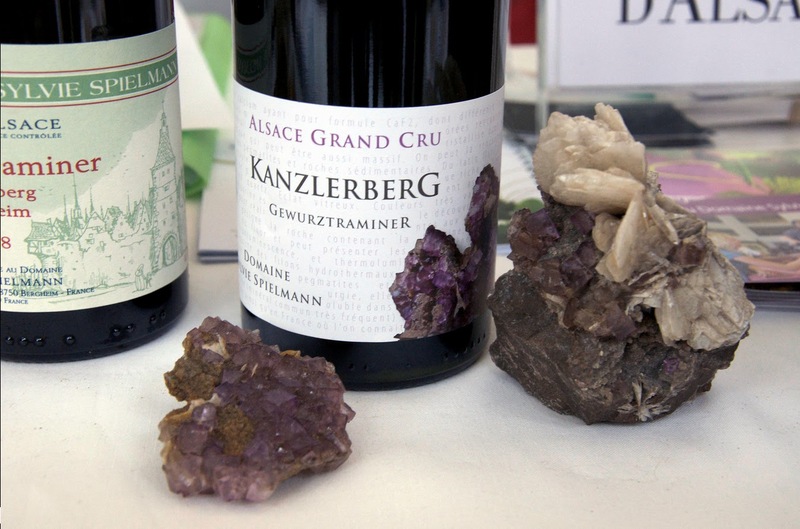 Wine tasting and visiting a vineyard located in an old fluorite quarry, in the Alsace wine region. • July 1: Visit the Clara mine in the Black Forest, Germany. Visit the showroom and shop of an international mineral dealer near Strasbourg. Dumps at the Clara Mine (copyright: Luigi Chiappino). 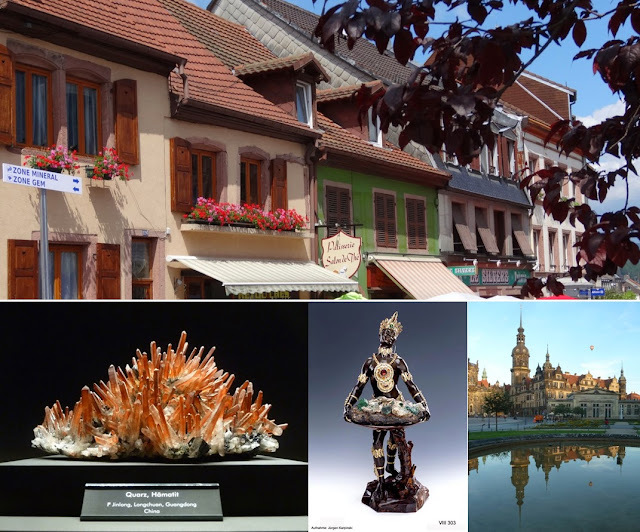 • July 2: All day in Idar-Oberstein, Europe’s historic gemstone center. Morning: visit to the historic gem cutting water mill (Weiherschleife) and to the Gemstone Museum (Edelsteinmuseum). Afternoon and private dinner at world-renowned dealer Constantin Wild’s workshop. 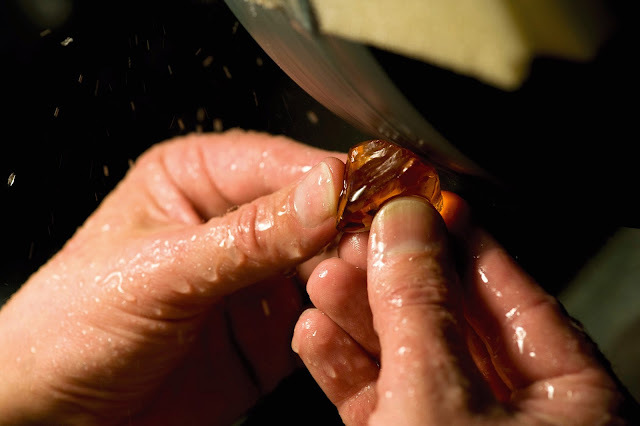 Tour of his gem-cutting workshop and gem showroom; possibility to “cut your own” gemstone. The day in Idar will include a tour of Constantin Wild's workshop (copyright: C. Wild). • July 3: Morning at master carver Andreas Becker’s workshop (family business since the 16th century). 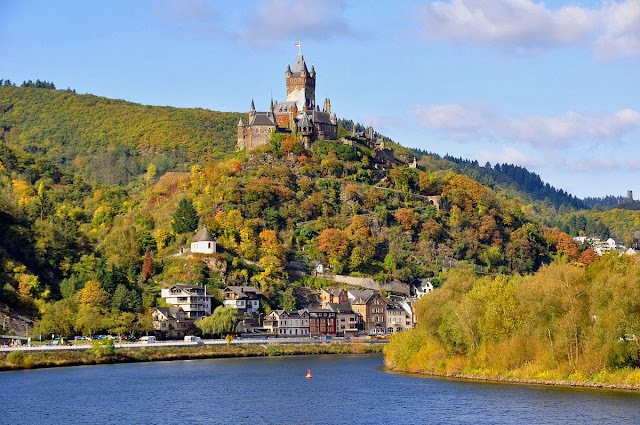 Afternoon: travel along the beautiful Mosel River Valley, famous for its delicious wines and incredible castles. 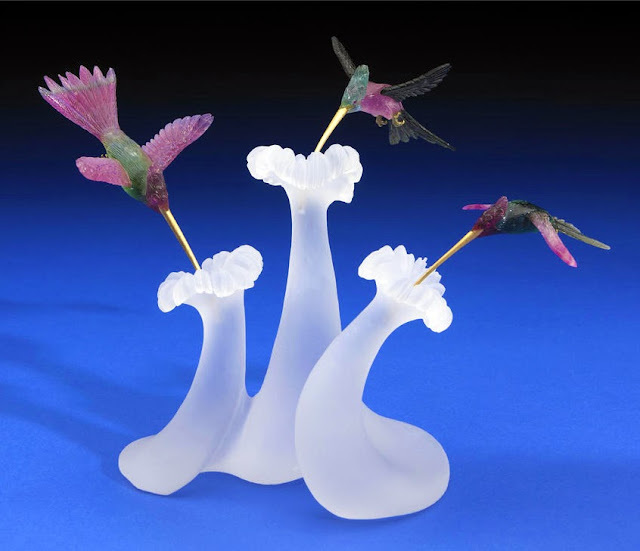 Hummingbirds by Gerhard Becker, carved out of Californian tourmalines (copyright: Bohnams). • July 4: Tour some gorgeous castles near Cochem, Germany before traveling to Dresden in the afternoon. Along the Mosel River: the Cochel Castle (copyright: H. Peierl). • July 5: Visit to the Old Green Vault (Grünes Gewölbe) in Dresden, housing the extraordinary treasures of the Kings of Saxony. Afternoon free to enjoy the beautiful and historic city of Dresden (optional activities recommended by staff). 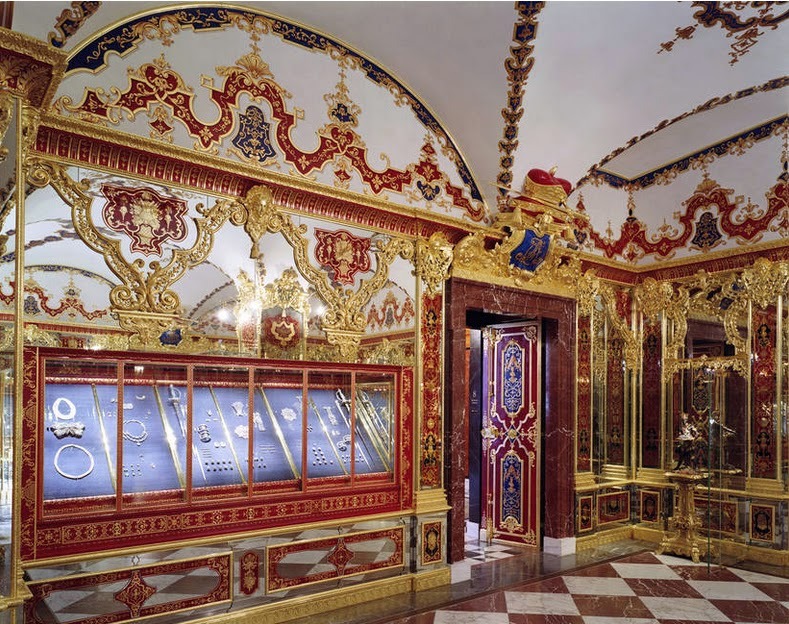 The Jewel room at the Green Vault (photo: D. Brandt, copyright: SKD). • July 6: Visit the historic mining town of Freiburg, Germany. Morning: private tour of the renowned mineral collection of the Technische Universität Bergakademie Freiberg by curator Andreas Massanek. Afternoon: visit to Terra Mineralia, a new museum featuring the collection of Dr. Erika Pohl-Ströher, with over 3,500 spectacular mineral specimens on three floors. • July 7: End of tour. Reserve early, space is limited. Download the travel information sheet HERE.